In a 60-minute video, David M. Walker discusses similarities between the Fall of Rome with our falling America, and other related subjects. Does this pertain at all to America's recent Secondary Full Moon @ 4Vir/Pis10? 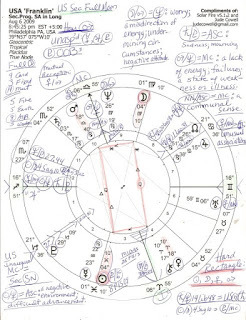 On my WordPress 'tapestry' blog some months ago, I posted the chart of the US Secondary Full Moon with details, based on the US 'Sibly' natal chart (July 4, 1776, 5:10 pm LMT, Philadelphia, PA) which perfected on Dec 24, 2008 - and time-wise was well-snugged in the midst of the dying throes of the Bush-Cheney administration and US financial collapse proceedings and the heistings made possible through TARP bailouts of the banking culprits and Wall Street gentry who were behind the stink. George Bush began by sneaking in the White House's back door and left by the thieve's escape hatch, imo. A Secondary Full Moon (based on the daily movement of the Sun - one day = appr one year) is a timing mechanism by which we may see when the natal entity (person, nation, event) has expanded as far as it can - time to pull back and become more realistic for a pentacle of effort and achievement has been attained. The current transit of Saturn (Mr. Reality himself) to US natal Neptune 22Vir25 (ideals, dreams, delusions) underscores this need to pull back, for Saturn-to-Neptune is the 'facing grim reality' transit; transformative Pluto's grind through Saturn-ruled Capricorn is having its destructuring/rebuilding effects as well. But as with life, Astrology is a pos/neg blend: Saturn-to-Neptune may also indicate dreams (Neptune) becoming real (Saturn) - but whose dreams?, I'd like to know. That our ideals should become more realistic is obvious. But why stop with our own culpability? This cycle isn't new, it's old, as evidenced by the culminating Sec Full Moon. It is a grim reality is that the American expansionists of the 1890s - the Robber Baron class of natural resource plunderers, international bankers, and their ilk, and most definitely politicians including Teddy Roosevelt - have taken this nation into bursting mode after piling up all the riches they could along the way. Sassily I assert that some Washington politicians are astrologers or, as Reagan once did, employ them, so that they know the expansionist jig is up, too, and have long seen it coming. It's an example of natural cycles and laws of the universe, and thus cannot be denied; yet the situation shown astrologically and manifesting in the real world can be 'worked with' and improved upon. For that we are grateful. The outcome of loss and misery is such that it makes the decades - centuries - of banking foibles and deceits no less heinous for the average family, yet I admit that I do like to see large issues done in black and white - and an Astrology chart suffices perfectly for me. Therefore, I am publishing here the US Sec Full Moon chart based on the Franklin natal chart (same date @ 2:21 am LMT) which gives a different date for the perfection of the US Sec Full Moon: August 6, 2009, the day Congress ended its current session for the August recess - and more recent than Dec 24, 2008. You know the immediate results of many reps' experiences with 'town hall' meetings and shout-downs, some of which were richly deserved. Please click to enlarge the chart for my notations which you may admit are even messier than usual (probably because I'm still trying to overcome a painful ear infection so I'm not up to much snuff); you will see highlighted in red a Hard Rectangle pattern between Sun, Moon, Venus, and Mars Rx. My previous post has Hard Rectangle details, if you'd like to read them and view Dec 24, 2008's Sec Full Moon chart with a few notes. Saturn/Pluto = ASC: being placed in cumbersome and difficult circumstances; mourning; sadness; separation. Sun/Neptune = ASC: difficult life advancement; a negatively inclined environment; associations with weak or sick persons. Mars/Neptune = Mc: lack of energy; hopelessness; failures; a state of weakness or sickness; one's own world prevails; losing contact defensively; rebuilding the inner spirit. NN/Asc = Mc: community spirit; striving for close cooperation with others. Moon/Mars = Neptune: weaving a spell for personal gain; possible duplicity; emotional magic; a negative attitude or character; worry; grief; a misdirection of energy; undermining circumstances affect family life detrimentally. neg/unconscious/shadow side: over concern with superficial form and ceremony. Somehow I think that when Bush and Cheney absconded, the hawks took most of the woman's chickens with them. Keynote: The need to face the antagonism of "powers of darkness" as one attempts to feed the mind of as yet helpless and frightened apprentices. The most basic "Law" of our universe is that every release of new potentialities (or modes of energy) brings about a polarization of effects--that is, the new potentiality will be used both for construction and destruction. It will arouse individuals (or groups and nations) to take a series of steps which will lead some to greater success, others to deeper failure. Whoever makes possible this new release has to accept the karma of both the success and failure. When Jesus showered his immense love upon lukewarm, self-centered individuals, it inevitably came to be turned into violent hatred when these soul-minds were unable to cope with its frightening intensity. Jesus had to accept spiritual responsibility for those who crucified him. Rudhyar goes on to explain '7Lib' in terms of 'the forever-present struggle involved in making it possible for the future-oriented actualizers of an ideal to survive the attacks of tradition-worshiping minds that can only follow the lines of automatic response.' The Keyword is: GUARDIANSHIP. Yes, well it's the 'future-oriented actualizers' of Washington with their secret backers and enablers - those of the 'powers of darkness' persuasion - who concern me most when it comes to my only nag in the race which was, is, and will continue to be the United States of America. US Secondary Full Moon August 6, 2009; based on our 'Franklin' natal chart of July 4, 1776, 2:21 am LMT, Philadelphia, Pennsylvania, which gives independence-minded, freedom-loving Uranus rising, Moon (We-The-People) @ Midheaven. Woo, thnx, Julie! Glad you're stickin' around too - your byh-bye message was a scare 'cos even if i don't mention it, i always depend on your Weekly Forecasts as do so many others!! !